Welcome to the weird and wonderful world of screen printing, a place where a simple design can go from a digital design mockup to high quality t-shirt in just hours. As experts in the screen printing business, we’ve taken time to make our process as simple and efficient as possible. And although not every t-shirt is made by screen printing, we think it produces the best result overall. Ever wonder how your favorite graphic tee was made? Here’s our process from start to finish in 8 simple steps. 1. First we coat a blank screen with a light sensitive emulsion. Translation? It’s basically a film of paste that hardens when light is projected onto it. A screen covered in emulsion, waiting to be thrown in the lightbox. 2. Then we take a thin, transparent piece of film and print the shirt design on it. This artwork goes onto that blank screen we just coated, and it all gets thrown into the light box for exposure. The lightbox (which also looks like 4 of Luke Skywalker's lightsabers). This burns the design into the emulsified screen. 3. When the light hits the screen, the emulsion hardens in all the places except for the printed design (which is black, so it blocks the light). This creates a positive of the artwork, which is kinda like a cutout of the design. We then take the screen out of the lightbox and spray it down with a pressure washer to get rid of all the extra emulsion that didn’t harden within the design. Now all that’s left is the printed design on the screen. Here's an example of an artwork positive. A cutout of our logo has been left in the emulsified screen after it was exposed in the lightbox. Our screen printing press has 6 arms. Right now, it has 4 pallets loaded on it. For shirts with multiple colors, one color of the design will be loaded on each pallet. 5. Next, our Screen Printing Guru will hand-mix different colors of plastisol to get the best color hue for the project. Plastisol is a thick ink commonly used for printing on fabric and, unlike water-based ink, is not water-soluble. Once the color is just right, we slap that ink straight on the screen for printing. We use plastisol inks for our designs. These tubs are marked to help us find the right hue for each print. 6. Now it’s shirt-printing time! First we put a blank shirt onto the pallet board, straightening it by eye so that the design doesn’t print out crooked. 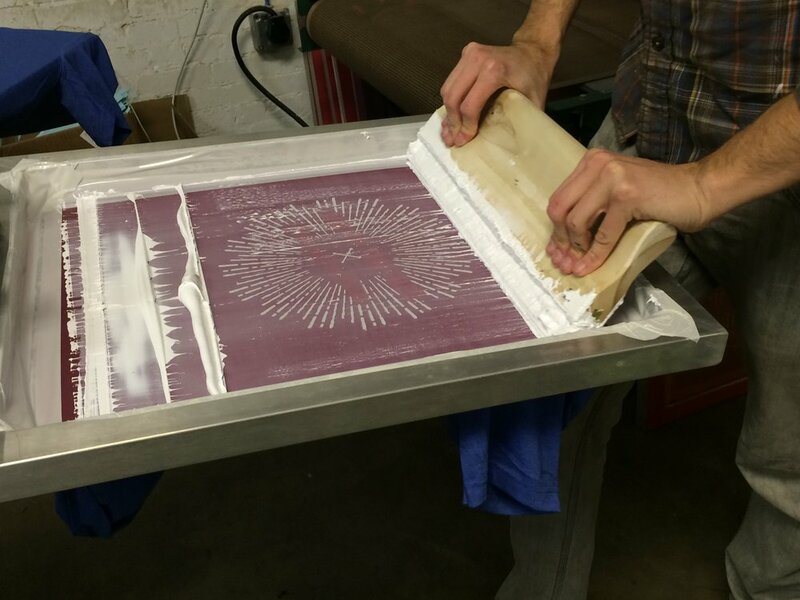 Then we lower the screen on top of the blank shirt, and using a squeegee, spread the ink through the design positive. Usually one firm push-through does the job, but if a client wants the design to come out extra bright and bold, we’ll push-through twice. The squeegee presses the plastisol ink through the design positive and onto the t-shirt. 7. Then, the screen is lifted up and the shirt is removed from the pallet for drying. We place our shirts on a high-heat, conveyor belt dryer. The shirts are then moved through the 800°F mini-oven and about 15 seconds later, come out the other end warm and dry. Shirts run through the dryer on a slow-moving conveyor belt. 8. That’s it! Shirt printed. Simple. Once all the shirts have been printed and boxed for pickup, we’ll reclaim the screen by soaking it in a solution designed to remove the emulsion. This basically just means we soak it for a while in some chemical stuff so that we can wipe the screen clean, and use it for a new design. After a quick final rinse with the pressure washer, we arrive back at the beginning with a clean, blank screen. Next design please! A few of our original designs hanging on the wall. Do you have a screen printing project you’d like to get off the ground? We’d love to talk. Drop us a message or give us a call to get started. Include the code HOW2PRINT in your message, and we'll take 10% off your first order.